A SINN FÉIN MEP who was caught up in last night’s Strasbourg Christmas market shooting said the scene was full of “mayhem and confusion”. 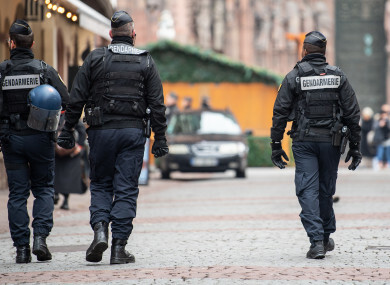 A lone gunman killed at least three people and wounded 13 others at the famed Christmas market in France’s city of Strasbourg. The attack took place at around 8pm (7pm Irish time) yesterday on one of the busiest streets of Strasbourg, sending crowds of shoppers fleeing for safety. Police union officials have since identified the suspected assailant as Cherif Chekatt, a 29-year-old with a thick police record for crimes including armed robbery. The two officials spoke on condition of anonymity because they weren’t authorised to publicly discuss details of the large and ongoing investigation. Speaking to EuroParlRadio, Sinn Féin MEP Martina Anderson said “once we heard the shooting and once we realised it was shooting, we turned to run”. She said that “not everyone in the market would have realised what was happening” on the street of the shooting and “were actually walking out of the market, heading towards it”. “We felt we needed to get particularly children and young people and get them out and get families notified,” Anderson said. A girl was coming out with a newborn baby and we were screaming at her and her husband to get back in and not to come out. “There was a lot of mayhem, confusion, people were running in all sorts of different directions. Some people were hitting the deck, on the floor, and just people not knowing where to run to,” she said. Local officers earlier said in a statement that “the attacker, who was on the S list (of extremists watched by police), is actively being hunted by security forces”. It said some “350 policemen and gendarmes are still deployed on the ground,” backed up by helicopters, elite units and soldiers deployed as part of a long-term nationwide anti-terrorism operation. Interior Minister Christophe Castaner earlier said France had raised its security alert level to “emergency attack” with “the implementation of reinforced border controls and tightened controls on all Christmas markets in France to avoid the risk of a copycat” attack. Also speaking to EuroParlRadio, Fine Gael MEP Mairead McGuinness said that she was in parliament in Strasbourg when she heard the news of the shooting. The Strasbourg-based European Parliament was on lockdown last night, with MEPs, staff and journalists unable to leave the building. “What happened afterwards was that some people just stayed in the parliament. I actually stayed in my office, I slept in my office because I wasn’t sure what was the right thing to do and there was quite a chaos around cars,” McGuinness said. Turning her focus back on the victims of the shooting, she added that “the real tragedy is that they were people going to a Christmas market”. “Their families must be devastated. There are people seriously injured and I suppose it had echoes of other attacks in the past,” she said. “We know that in Brussels Airport there was an attack which deeply affected Brussels, we’ve had Christmas market attacks. So, I think we’re all just trying to stay calm and get our heads around what happened. It just speaks to this horrible reality in our midst that there are individuals who will do things like this. It’s very hard to understand what motivates them or how they could even think about killing another person in the callous way they have. I think what’s really alarming is that they’re still at loose. McGuinness added that she believes this shooting will “tarnish” Christmas in Strasbourg. Email “'We saw a woman with a baby … we were screaming at her’: Sinn Féin MEP caught up in Strasbourg shooting ”. Feedback on “'We saw a woman with a baby … we were screaming at her’: Sinn Féin MEP caught up in Strasbourg shooting ”.